For hair loss sufferers, the feeling of desperation to find a treatment can be overwhelming. 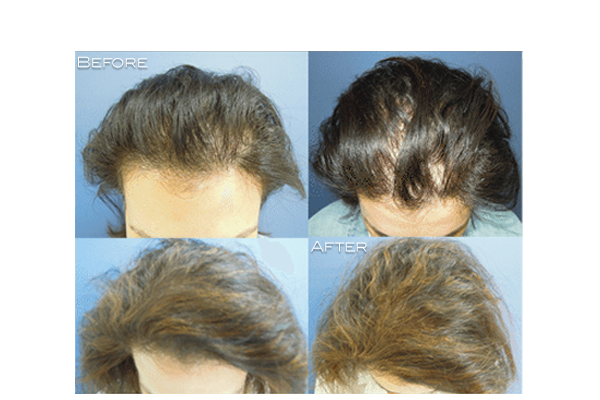 It seems like it would be easy in a saturated market of creams, ointments, supplements, scalp stimulators, and a variety of other “miracle treatments” promising to regrow hair. Hair transplant and other surgical treatments are invasive and costly and at times provide unnatural results. With so many “snake oil” treatments available, it is more likely to find disappointment time and time again. The good news is, there is a solution – platelet rich plasma (PRP). According to the American Hair Loss Association, androgenetic alopecia (male pattern baldness) accounts for more than 95% of hair loss in men, and by the age of fifty, approximately 85% of men have significantly thinning hair. And if you thought hair loss was a man’s disease, think again. AHLA goes on to say that women make up 40% of American hair loss sufferers. Although alopecia (hair loss) is a very common condition, it is a disease that has wide-reaching effects on its sufferers, including a severe decline in self-esteem, burdening relationships, and even affecting their professional lives. Platelet-rich plasma (PRP) treatment is a great solution for the non-surgical treatment of alopecia (hair loss) in men and women. PRP therapy for hair loss is a treatment that involves withdrawing a patient’s blood (in the same manner as a routine blood test), processing it in a centrifuge to separate the PRP from the rest of the blood, and injecting it into the desired areas of the scalp. After the PRP is injected, the treated areas are micro-needled, and the remaining growth factors are spread over the treatment area for complete coverage. Patients are sent home with aftercare instructions and medications are often used in home-care regimens to optimize and prolong the effectiveness of the treatment. PRP is blood plasma fortified with platelets that contain several different growth factors and other proteins that affect the cells around them, in other words, stimulating stem cells in the microenvironment of the hair follicle which facilitates new cellular growth. Three PRP treatment sessions are required for optimal results, 4-6 weeks apart. Call (480) 451-1700 to schedule your complimentary consultation with one of our Nurse Injectors to see what PRP treatment can do for you!